We’ve started work on another new project, which we’re calling the PiMinder. It’s still a work in progress – don’t have any photos yet – but it’s coming along, so it’s probably best to start writing about it before things get really, really hectic. The PiMinder is a “market minder” – a device for keeping track of your shopping list. Old-fashioned ones were boards with common grocery items – milk, eggs, bread, etc. – painted on, and you’d check off what you need by putting a peg in a hole next to that item. The advantage of moving to a digital version is that you can synchronize it with a Web service, and check in on what you need from your smartphone, tablet or desk at work. That makes it a LOT easier for couples and families to keep track of what they need from the grocery store. No source code is given. 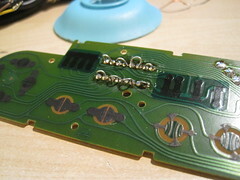 Circuit boards with six light-up buttons connected over I2C. We use the MCP23017 I/O expander rather than 74HC165 and 74HC594s gives us both inputs and outputs in one part, and lets us chain up to 8 boards of light-up buttons off the same I2C bus. The MCP23017 is well-supported on the Pi. 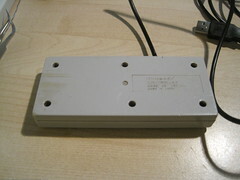 An IKEA RIBBA picture frame as the enclosure. This can be scaled up depending on how many boards/items you need. Three sheets of laser-cut plastic added to the RIBBA frame. 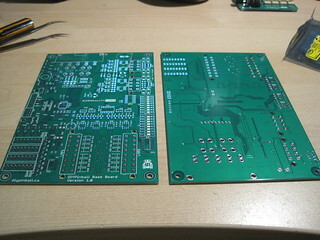 One to hold the circuit boards in the frame, one face plate, and one plate to mount labels on. 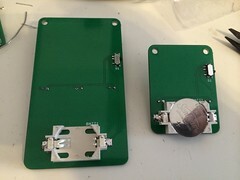 These last two form the front panel of the device. A Node.js-based service for synchronizing grocery lists. This will use Angular.js for editing the list and using it from a desktop, tablet or phone. A Socket.io interface will allow real-time updates when a list is modified in any way. That way, the app and the device are always in sync. A Node.js-based program running on the Raspberry Pi to receive events from the web service and send updates based on buttons being pressed. Using Node.js makes it easy for us to use the same interfaces as the mobile app, which really simplifies the server. There are also some decent libraries for working with the MCP23017. This architecture lets us make multiple PiMinders that point at the same list (but not necessarily the same items on that list), and have them all keep synchronized with each other. 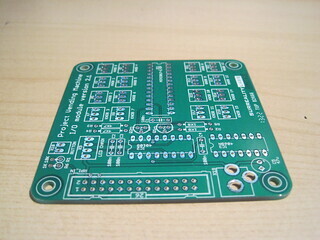 It also lets us keep costs down – estimated cost of the prototype is under $100, and subsequent ones are much cheaper due to minimum orders for circuit boards and what not. This project is going to be evolving quickly. Currently, the boards are in and populated, and the server and web app are close to working. 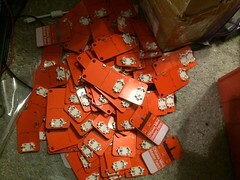 Laser cut plastics have been designed and just need to be actually cut. 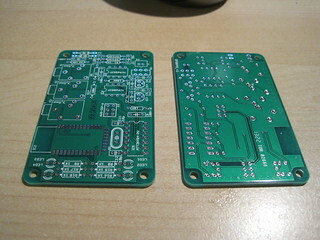 From there, it’s a matter of assembling physically and finishing the Pi-side software. Getting the first version of that will be simple – getting a nice configuration interface going is going to be a bit trickier. 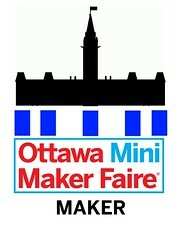 The plan is to have this ready to demonstrate in time for Maker Faire Montreal on June 7 and 8. Even with spending a week in San Francisco for Maker Faire in… wow, less than two weeks… this is looking very doable. One more thing: this project will be fully open-sourced when it’s working. 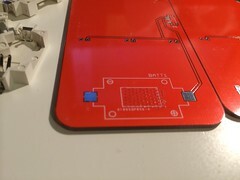 That includes the server-side Node.js code, the Raspberry Pi code, PCB layouts, and CAD files for the laser-cut plastic in the RIBBA frame. 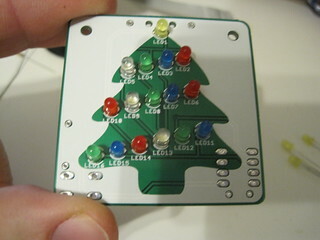 Two years ago, I made a snowman circuit board. 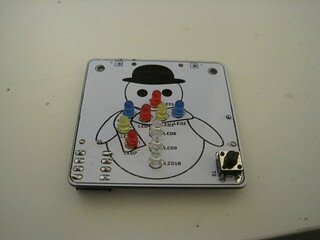 It was a fairly simple board – white with black silkscreen artwork, and a bunch of LEDs for the scarf and buttons on the snowman. 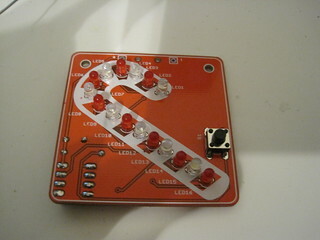 A small PIC microcontroller handled blinking the LEDs in various patterns, and a button allowed the user to switch between patterns, as well as turn the unit off. 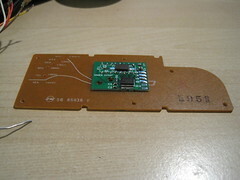 Power came from a small watch battery. I made 100 of them, and they were a huge hit. 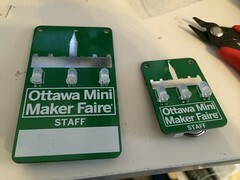 I’ve shown these at various Maker Faires over the two years since, and one question always came up: “Are you selling these?” Two years later, I’ve finally gotten the message, and came up with a new design. 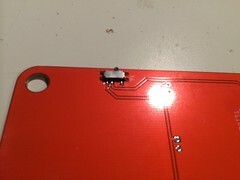 While the original was an all-Surface Mount affair (since I was the one building all of them), this new design is a through hole design, intended to be distributed as a soldering kit. There are four different designs, as well: a snowman, a snowflake, a candy cane, and a christmas tree. 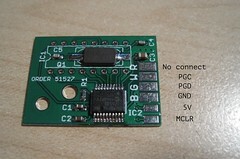 It’s also designed around an AVR microcontroller so that an open source toolchain can be used. In this post, I’ll go over each of the boards quickly. 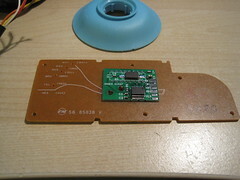 Future posts will cover how the hardware and firmware works, how to assemble them, and how to modify the firmware to change the blinking patterns. 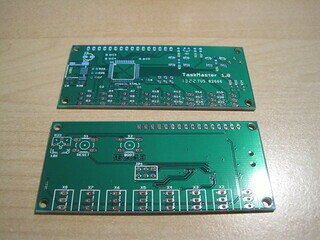 The boards have turned out very well. 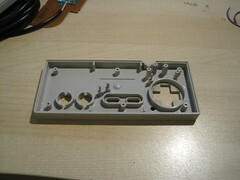 I’m still waiting on a few parts to arrive, so unfortunately I’m not going to be selling many this year. 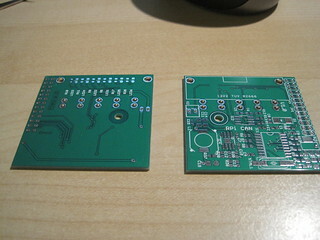 However, with a few tweaks I should have them ready well before Christmas next year. 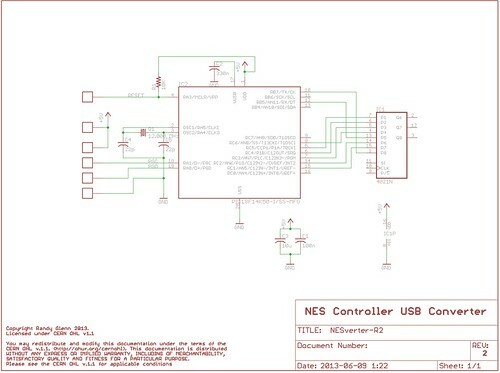 The next few posts will go over the design and build instructions, as well as some lessons learned in the process. 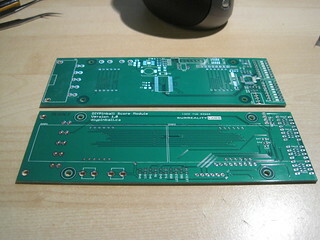 These boards are being released as open source, so you’ll be able to make your own if you like and modify as you see fit. 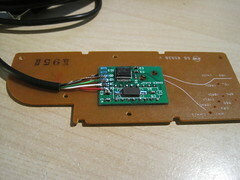 Just a quick update on the Bluetooth Polygraph project. More description is coming soon – possibly full documentation before the Waterloo Maker Faire this weekend – but this’ll have to do for now. The pulse sensor (actually a Pulse Sensor Amped) and the GSR sensor (based on / blatantly copied from Make’s Truth Meter) both work nicely over Bluetooth. A processing app is currently graphing the data on a strip chart. I still have to build the respiration sensor, and get the app working on my Nexus 7, but I’ve already tried the stripchart (slavishly copied from this code on OpenProcessing) on the Nexus, and it worked nicely. Bluetooth functionality will be provided courtesy of the Processing BtSerial library from the Arduino folks, which I’ll be providing instructions on how to install, as well (since it doesn’t come with a .jar file). So there’s still some work to do, but a manageable amount, and we should be done and possibly even documented in time for Waterloo Maker Faire. 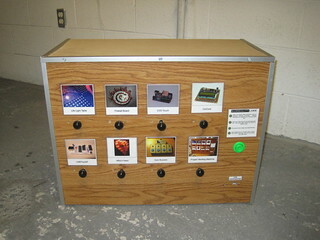 The Project Vending Machine is a vending machine for digital goods – files, specifically. Vending Machine is a bit of a misnomer, actually – no money changes hands in this implementation, but vending machine is about the closest analog that we could come up with. 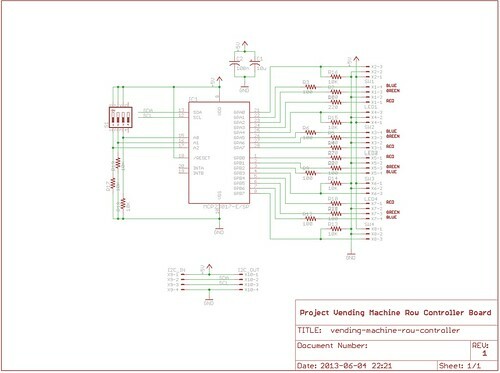 It’s pretty simple to operate – you plug a USB thumb drive into the USB port in the front, pull the knobs to select the projects you want – kind of like an old cigarette vending machine – and hit a button to copy them. A light for each project tells you if it’s selected, if it can be copied, if it’s copying, if it’s done or if there was an error. How it came about, I’m not entirely sure. At some point, we determined that it would be useful to be able to distribute digital files from a vending machine. I can’t say for sure what sparked it, but it may have been restrictive download caps. At any rate, we didn’t find anything like this that existed, and figured it could be useful for giving out project details at Maker Faire. 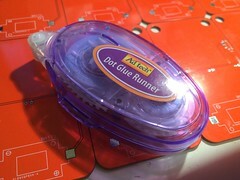 So we decided to make one for Maker Faire Detroit 2011. 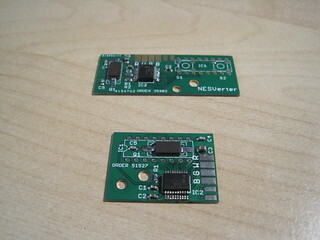 We investigated a few microcontroller-based methods of building it, but actually building that would be complicated and likely have compatibility issues. I wound up buying an Insignia Infocast 3.5 – a Chumby relative – at a good price at Best Buy. 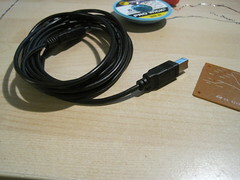 It runs Linux, has various ways of attaching buttons, and has USB support, so it would suit the system nicely. We decided that 8 projects would be an appropriate number, arranged in 2 rows of 4. 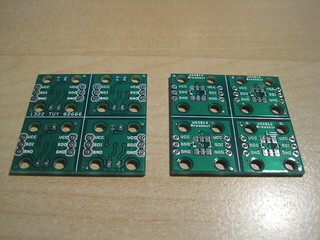 We went with a row controller PCB for each row of 4. 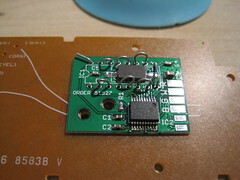 Given 3 outputs for each status LED and one for the input, this meant 16 lines total per board. 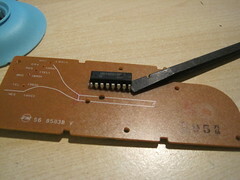 This fit perfectly with the MCP23017 I/O expander from Microchip, which would allow us to chain mutiple devices from the Infocast’s I2C serial bus. 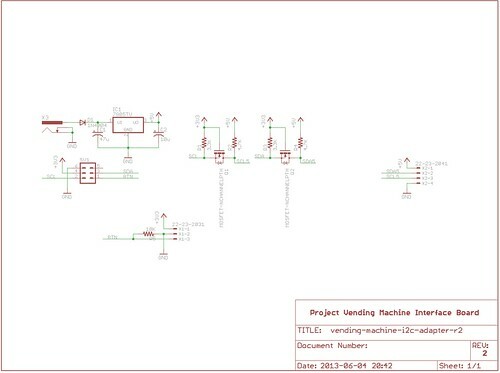 Up to 8 MCP23017s can be added, which would mean up to 32 projects per vending machine. 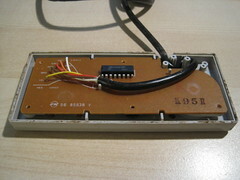 The start button was to be hooked up to one of the Infocast’s built-in GPIO pins. Having Linux as a base meant a wide variety of programming languages available to us. We wound up going with a combination of C and BASH. Having Linux as a base also meant that the file handling stuff was already, well, handled. 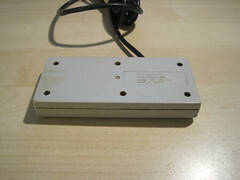 Using off-the-shelf I/O expanders meant that no firmware had to be written – only host software. Not having to write and debug firmware nor develop an over-the-wire protocol to communicate with that firmware saved a *ton* of time. 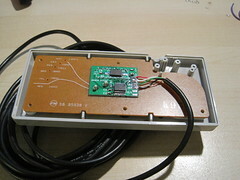 The Infocast, with its I2C and I/Os broken out via a ribbon cable. 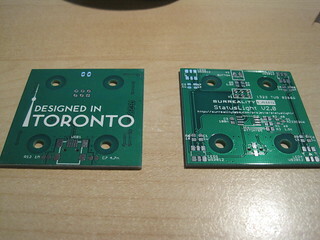 These were built on protoboards, but we do have PCB layouts that we never built. They’re included in the source code further down. 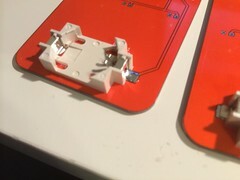 We used a Sparkfun breakout with some holes drilled to mount it to the frame. 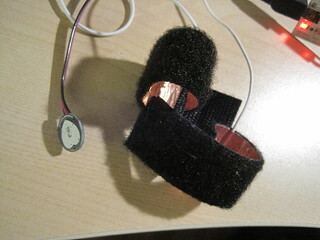 Linux on the Chumby. 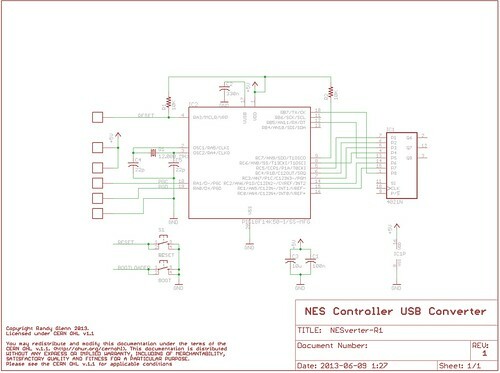 This handles a lot of things – I2C driver, file handling, and even automatically mounting USB drives. About the only thing we changed here was upgrading the SD card in the Infocast / Chumby, which we followed instructions here for. 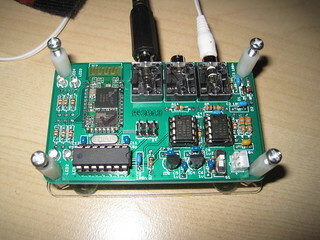 Programs to interact with hardware. These were written in C, based on samples posted to the Chumby forums. 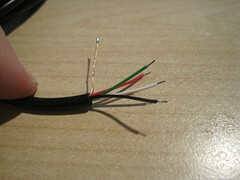 The source code for these is included in the download below. The overall control script, written in BASH. 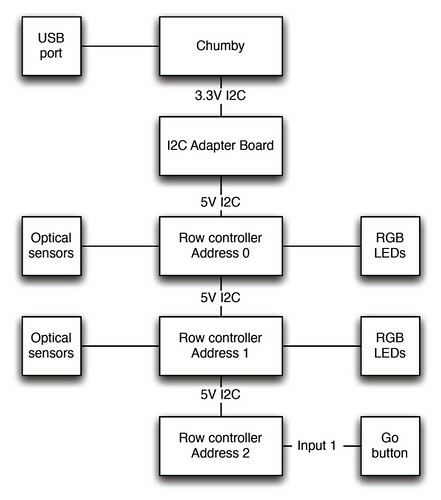 This was basically a state machine to run the overall process – it would turn on or turn off LEDs for each selected project. They’d be yellow if no USB drive was available, or green if one was. If the drive was available, the Start button would also be checked. Once it was pushed, the script would start copying files, turning the light purple while it was copying, blue if it was done, or red if it failed. It would do this for each selected project, then wait until the storage device was removed before resetting. The source code is available for download here. To set it up, you’ll need a Chumby or Infocast with developer tools installed – once you SSH into it, just try running gcc, and it should tell you how to get that going. Then, use the Makefile to compile the C programs. After that, edit the shell script to specify the project files. When you’ve got the unit hooked up to the hardware, run the script to operate the machine. 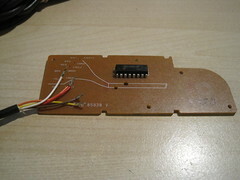 It will output somewhat useful debug data as it runs to help determine what it thinks is going on. I don’t have final plans for the overall machine. It was basically made of a few horizontal “slices” made from Select Pine 1x2s. 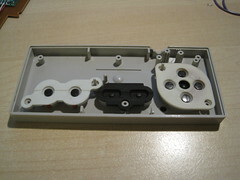 Top and Bottom were basic rectangular frames, while the two middle ones – for the rows with knobs – had horizontal cross-members, and holes for both LEDs and the selector knobs / dowels. 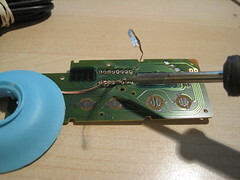 The cross-members were used to make sure that the knobs slid smoothly and straight. 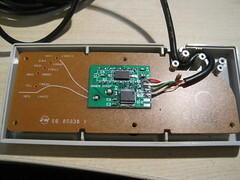 Sensors were put on the back edge of each slice, and the LEDs were attached behind the appropriate holes on the front. After these slices were assembled, they were combined with vertical 1x2s to form the overall box, which then had woodgrain-printed masonize attached to the sides, and MDF panels on the top and bottom. Aluminum trim was added for the 70s Cigarette Machine look. 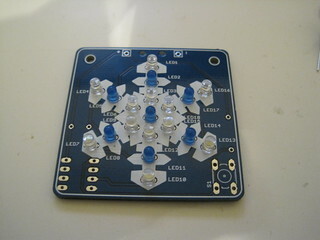 Holes were drilled for the LEDs knobs in the fron panel, and then everything was wired up. We learned a bunch doing this project. 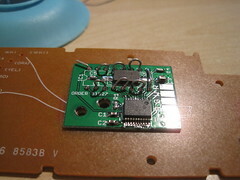 Using Linux as the basis made some of the tricky stuff really easy, but also made diagnosing I2C errors a bit harder. Having I2C over long distances with poor wiring was a BAD idea – lots of noise would lock up the bus, which made it stop responding and kept the Chumby from reading its configuration EEPROMs on start, making a reboot to clear everything and get it all working again somewhat invovled. 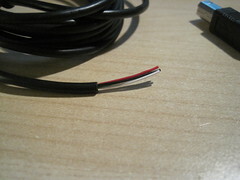 So I2C with lots of wire should be avoided in future. 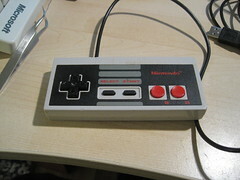 We didn’t get the GPIO-based start button to work, so we wound up using an extra row controller with a single button to do that. This required minimal modification to our scripts and worked pretty well. The frame was way too big and way too heavy for what it had, and was a pain to move in and out of the Faire. More than a few people remarked on how much it looked like a cigarette vending machine. The knobs with the optical sensors worked incredibly well, and were a great demo to show kids who were coming by. The Chumby proved to be a bad choice, once they stopped being available for sale not long after we showed off the project. It worked, but now the ability to duplicate it is severely restricted. 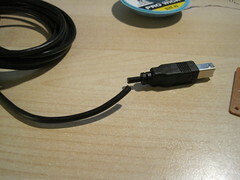 The biggest surprise, though, was that next to nobody had a thumb drive to copy stuff to. Overall, though, it was a great project that was a lot of fun (though a bit stressful at the end) and was VERY well received. We liked it enough to do a bigger and better version in 2012. Sadly, now the first vending machine is now gone – it was too big, and taking up space. More projects are underway, though! 3D printers are the new must-have tool for people who make things. Personally, I want one for two reasons: designing and building custom enclosures for electronics projects, and putting the heads of my friends on Pez dispensers.